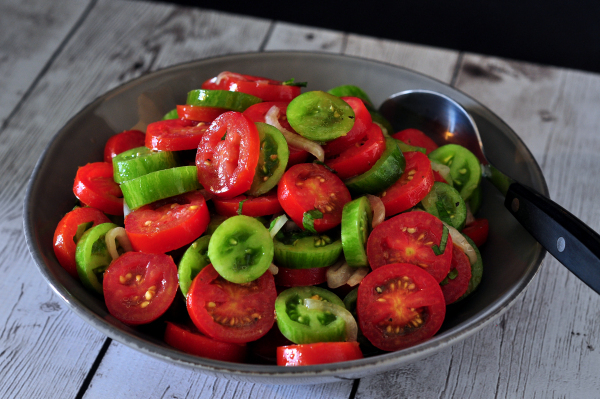 Cut the tomatoes into slices, or quarters, depending on the type that you use. Combine the tomatoes and onions very gently in a medium sized bowl. Use a microplane or other fine grater to grate the garlic into the vinegar, and stir them together - allow to sit for 5 minutes. Add the salt, pepper and honey, and whisk together until the salt is dissolved and the honey is mixed in. Stream the oil in while whisking vigorously, until it is all incorporated. Add the dressing and the basil to the tomatoes, and stir gently. Allow to sit at room temperature for about 2 hours and then serve. Best eaten the same day, but refrigerate any leftovers.